Moving into a new house in an incredibly exciting time. All the blood, sweat, and tears you put in viewing tons of houses, getting your money in order, and putting in offers is over, and you can finally moved in and start settling into your beautiful new home! But homeowners know there is always work to be done. Once you’ve moved in your furniture and unpacked your boxes, it’s time to think about what you need to do next. 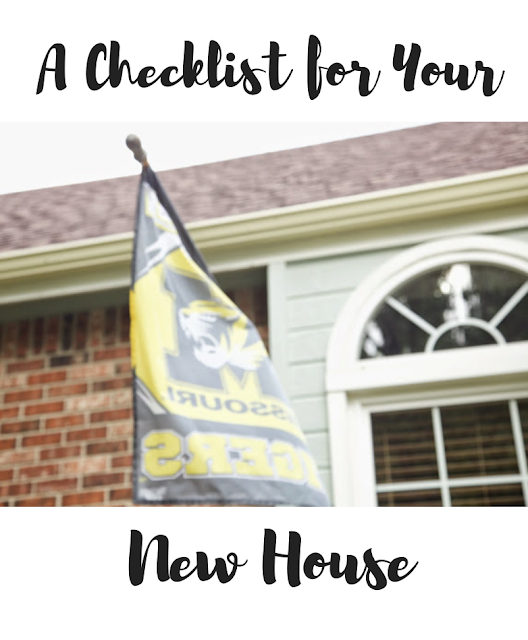 Here is a checklist for practical tasks to knock out in your new home. First things first: inspect the house. In fact, do this as soon as you have the keys and before you start to move in your own stuff. This gives you a chance to look around and make sure that the property is exactly as it was when you viewed it. If there are any differences, such as any new damage or some furniture that was included in the sale agreement isn’t there anymore, you can take this up with the estate agent. They can then contact the seller to address any issues. Don’t waste any time trying to sort this stuff out. Once you're sure that everything is alright with the house, you'll need to give it a deep clean. Even though they cleaned before they moved, it's still best to get it super super clean before you start filling it- especially if the house was empty for a long period before you moved in! That way, you can deep clean all the carpets and wash the walls without needing to move any heavy furniture around to make room. Don’t forget to clean all those rooms and areas that are often forgotten about, such as the garage and basement. You won't clean them again for a while, so do it right! If you haven’t done so already, make sure your utility providers know you moved to a new property. In most cases, they will be able to seamlessly continue providing you with your utilities once you have moved, and will only need to be informed of your new address. However, there might be some firms that don't supply their specific utility or service to the new neighborhood that you move to. If this is the case, you'll have to cancel your account with them and make sure that you pay your bills right up to the last date you were in your old home. Then you'll need to start looking for a new utility provider to sign up with for your new property. Don’t forget about changing the locks! It's highly recommended that all new homeowners change the locks as soon as they move in as a safety precaution. After all, you never know just how many extra sets of keys are out there in the world. For example, what if the old homeowner gave a set of spare keys to a contractor so that they could access the house while the homeowner was at work? There’s no way of knowing whether the contractor got their own set of keys cut - these could easily have fallen into the hands of someone they shouldn’t have! Replace all your locks so that you know exactly who has keys to your home. If you've moved into a fairly old property, there’s a chance that it might not have double glazing in the windows. This isn’t a huge problem, but you'll eventually want to get them replaced with double-glazed windows, as it will massively increase your new home’s insulation. The replacement windows will use all of the latest double-glazing technology and will be expertly fitted into the walls so you don’t have to worry about drafts in your new home. As a result, you'll feel a lot warmer and more comfortable through the winter months! If you have kids, go ahead start childproofing the house. You may even want to consider it now if you don’t have children yourself. (We already had a baby gate in our house when we moved in and it's awesome! Additionally, if lots of your friends and relatives have kiddos and will be visiting you on a regular basis, then you might still want to ensure your home is a safe place for them. It isn’t too hard to do, just need to make sure that there are no sharp edges or corners that they could fall into. It’s also worth putting all fragile objects, such as ornaments, on high surfaces where kids won’t be able to reach them. If you will have children in your house on a daily basis, consider installing child locks onto your kitchen cabinets and put a baby gate at the top and bottom of your stairs. If you bought the house with major appliances included, such as the refrigerator and oven, then you might need to turn them back on. If the previous owner left the house empty, then they will likely have turned them off to ensure that no faults developed while no one was in the house. In most cases, just plug them back into a socket to turn them on. If the house has been empty for a really long time, then the previous owner might have even turned off all the electricity and power in the property. If this is the case with your new house, find the main fuse box and switch it back on. I’ve already mentioned that you'll need to change the address on all your utility accounts, but they aren’t the only companies you'll need to inform about your change of address. Let the bank, post office, insurance companies, and other important entities know your new address so you don't miss important mail. Make sure your home is safe and secure whenever you leave it. One of the best ways to do this is to install a burglar alarm. Not only will this deter potential burglars, but it might even bring down your content insurance premiums. If your budget permits, you could even go the extra mile and install some CCTV cameras as well. Lots of people are using the "Ring" device these days. Another thing to to consider is adding a light to your front porch. This should be a responsive one that turns on whenever it detects any movement. Finally, don't forget to go over to your neighbors to say hello and introduce yourself. They want to know who is living next door, and they just might become good friends of yours: people you can ask for help someday when you need it! As you can see, the work doesn’t stop once you move in! But it's an exciting and fun time, and it really isn't that bad once you start knocking things off of your list. Happy home ownership!